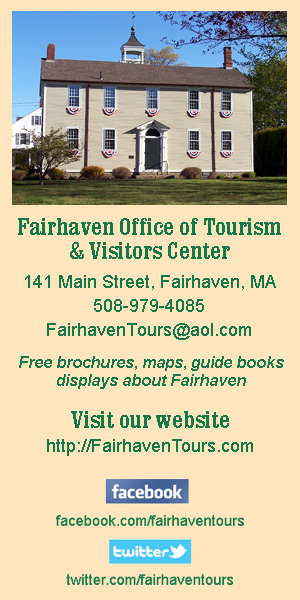 Selectboard members and members of the public leave the Selectboard meeting to check out Fairhaven’s new ladder truck on Monday, 1/14/19, parked in front of Town Hall. Note the Fairhaven blue on the ladder. The town was able to customize some features of the brand new vehicle. Photo by Beth David. Fairhaven’s new ladder truck is a state-of-the art piece of equipment that the Fairhaven Fire Department helped to design. Fairhaven Fire Chief Timothy Francis and Deputy Fire Chief Todd Correia displayed the new vehicle outside Town Hall on Monday, 1/14, during the Selectboard meeting. 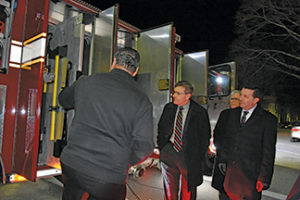 Selectboard members, Town Adminis­trator Mark Rees, and members of the public were able to take a good gander at the new truck and ask questions. The new truck will consolidate two pieces, wrote Mr. Correia in an email: The heavy rescue which is 23 years old, and the old ladder which is 35 years old. The new truck is expected to last 25 years. The ladder is 110 feet, the same as the old one, but the new ladder has the hose permanently fixed to it. This means that firefighters do not have to haul the hose up the ladder. It can also be turned on from below. The new truck has a 20 kw generator and a “full cascade system,” which means it can resupply air tanks for firefighters. It seats four firefighters and will also be used as the technical rescue vehicle. “This vehicle will make us more efficient with our responses,” wrote Mr. Correia. The truck con­tains all the cur­rent tech­nology, including LEDs, battery operated equip­ment. In addition to the aerial ladder, it has eight other ladders from 10 feet to 35 feet long. L-R: Fairhaven Fire Chief Timothy Francis explains some of the features of Fairhaven’s new ladder truck on Monday, 1/14/19, to Selectboard member Bob Espindola, Town Administrator Mark Rees, and Selectboard member Charles K. Murphy, Sr. Photo by Beth David. “All hose con­nec­tions are inter­operable with our neighboring communities, so the truck will adapt to other town equipment,” wrote Mr. Correia. Each firefighter has had at least 12–15 hours of initial training by the in house training lieutenant and the manufacturer. They will continue to train for the remainder of the year to obtain proficiency in the operations. 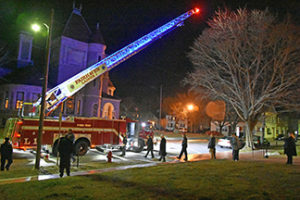 The truck took nine months to build, plus two months to customize it to the specifications of the town, including the use of Fairhaven blue on the ladder lights. It was designed by the Apparatus Study Committee, whose members include: Chairperson John Rogers (citizen member); Charlie Murphy, Select­board member; Timothy Francis, Fire Chief; Todd Correia, Deputy Chief; Robert Lincoln, EMS/Training Lieutenant; Brian Messier, FD Lt.; Joshua Benoit, Firefighter Paramedic; G. Bourne Knowes, Lieutenant and Tree Warden; Todd Cox, Firefighter; Donn Fletcher, retired Deputy Fire Chief (citizen member). Cost of the truck was just over $903K and $21K+ on equipment, for a total of about $925,000. At the Selectboard meeting, the chief and deputy fire chief thanked the board and Town Meeting for supporting the project. 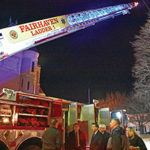 Fairhaven town officials and members check out Fairhaven’s new ladder truck on Monday, 1/14/19, parked in front of Town Hall. Note the Fairhaven blue on the ladder. The town was able to customize some features of the brand new vehicle. Photo by Beth David. 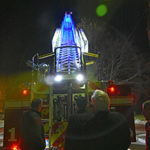 Fairhaven’s new ladder truck shines Fairhaven blue in front of town hall on 1/14/19, as it is checked out by town officials. The town was able to customize some features of the brand new vehicle. Photo by Beth David.